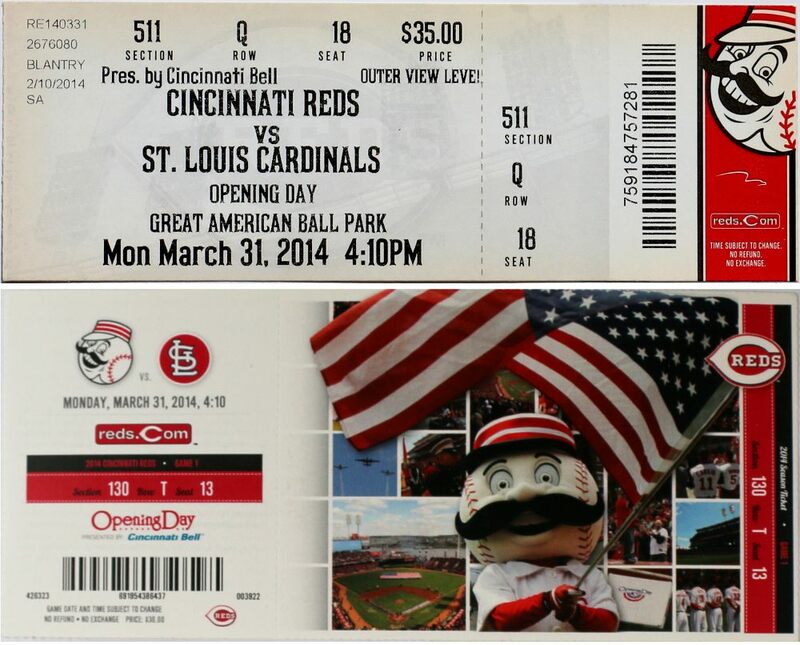 The collection of Opening Day Tickets presented here is brought to you by Gladish Solutions. Tickets stamped with the large red 'S' are season tickets. Hits and Strikeouts of 3000 club members are listed. 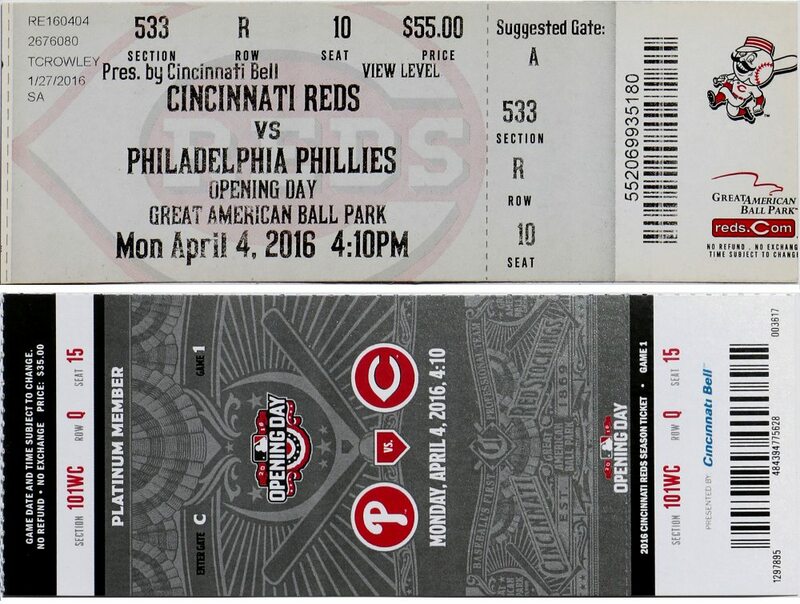 If you have an interesting in selling or trading ticket stubs (not only Opening Day ticket stubs), click here: Stub Sell/Trade. Game played at Redland Field, which would be renamed to Crosley Field in 1934. 4 HOFs played in the game. Reds HOFer, who played on the famous 1919 World Series team against the "Black Sox", Edd Roush, goes 0 for 4, but scores a run. Also for the Reds, Leo Durocher gets a single and Joe Stripp hits a Home-run; For the Cardinals: Frankie Frisch singles and Jim Bottomley get a double, both score a run. Flint Rhem gets the Win. For the Reds: Eric Tipton get the only extra-base hit for the Reds, a double; For the Cubs: Long time Reds favorite, Ival Goodman, in his last season, gets an RBI. Andy Pafko plays in his first opening day game and goes 0 for 3. Hank Wyse gets the Complete game, Shutout Win and Bucky Walters get the loss. For the Reds: Andy Seminick hit his 106th career Home-run. Ted Kluszewski and Joe Adcock both get two hits; For the Cubs: Hank Sauer hits his 136th career Home-run, which would be his 3rd of 4 Grand-slams and Randy Jackson hits his 20th career Home-run. Joe Hatten gets the Win and Frank Hiller the loss. Johnny Temple makes his major league debut with a Pinch-hit Fly-out in the 3rd for Cincinnati. The Cubs debut Toby Atwell and Bud Hardin. 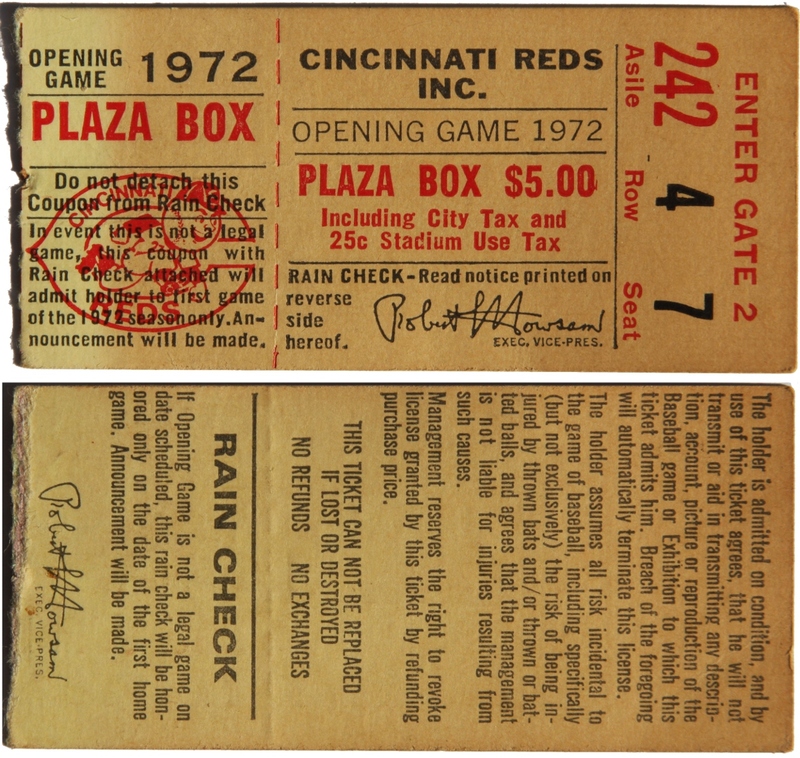 Note: A special thanks to Bob Bruckner for the scan of this ticket. For the Reds: Frank Robinson in his first at bat in his first game gets a Ground-rule Double in the bottom of the 2nd just after Ray Jablonski hit his 43rd career Home-run. Robinson would also get a single and a walk on the day. Ted Kluszewski hit a double; For the Cards: Stan Musial hits his 326th career Home-run (career hit #2,597) scoring Red Schoendienst, who had two hits on the day. Vinegar Bend Mizell gets the Win and Joe Nuxhall the loss. For the Reds: Ted Kluszewski gets a double and Frank Robinson (in his second year) hits a single; For the Cards: Stan Musial has 4 hits (career hits #2,782 to #2,785), which includes 2 doubles. Musial, who still owns the record for 4-plus hit games, would end his career with 67 4-plus hit games. Bobby Smith, in his major league debut, and Wally Moon both hit Home-runs. Herm Wehmeier gets the Complete Game Win with 4 strikeouts for his 82nd career win. 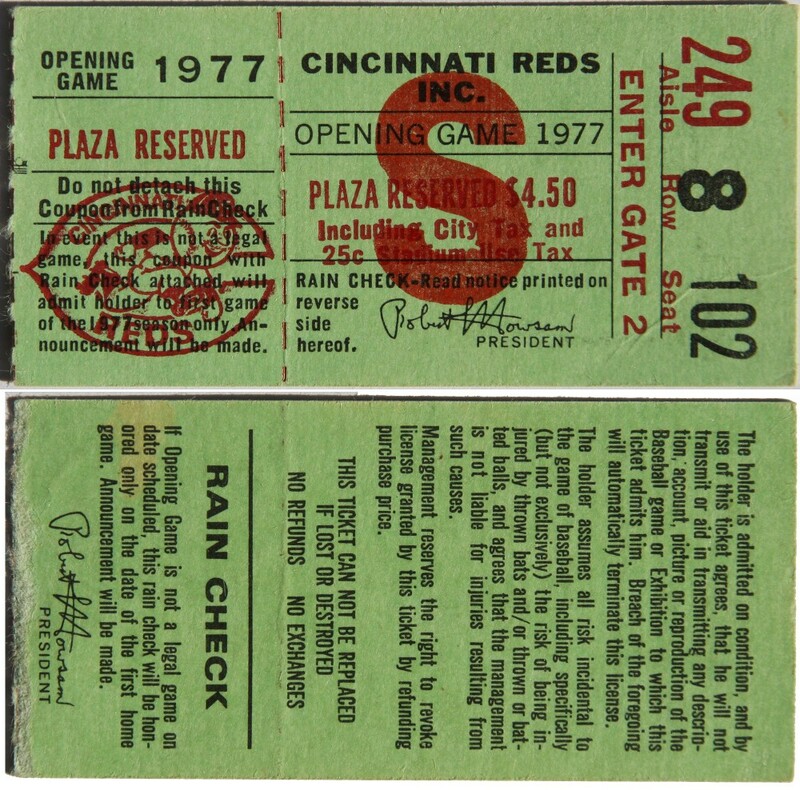 For the Reds: In the first inning, Frank Robinson hits his 166th Home-run. Wally Post pretty much locks up the win with a 3-run Home-run in the 3rd, his 172nd career Home-run; For the Cubs: Andre Rodgers scores the only run for the Cubs with his 14th career Home-run. Richie Ashburn and Ron Santo both get a single, Billy Williams and Ernie Banks go hit-less. Jim O'Toole gets the Complete game Win with 3 strikeouts. The Reds would go on to win 93 games for the season and go to the World Series for the first time since 1940. They lost the World Series to the New York Yankees in 5 games. For the Reds: Pete Rose hits a single and a Lead-off-Home-run (Hits #1110 & #1111 and Home-run #60 of 160 of his career) This was his first and only Opening Day Lead-off-Home-run of his career. Bobby Tolan also hit a Home-run (Career #13 of 86); For the Dodgers: Don Drysdale, in his final year, gets the Win (career #205 of 209) with 4 Strikeouts. Bill Russell and Ted Sizemore make their major league debuts. For the Reds: Pete Rose has a Triple and a double (hits #1,328 and #1,329 of his career). Bernie Carbo has his first career hit and Home-run. Lee May picks up his 75th career Home-run. Bobby Tolan has a solo Home-run (#34 of career). Jim Merritt picks up the win with 8 strikeouts. For the Expos: Rusty Staub has a triple and gets the only run for the Expos. Dave Concepcion makes his major league debut and Jose Herrera has his final game. For the Reds: Tony Perez has a two run Home-run (#138 of career). Bernie Carbo and Frank Duffy both have doubles. Johnny Bench has a hit and a run For the Braves: Hank Aaron gets a hit, his #3111. Felix Millan has 4 hits including a triple and has 2 runs. Phil Niekro gets the start and has one strikeout, #705 of his career. Cecil Upshaw picks up the win with 2 strikeouts. Wayne Granger gets the loss. 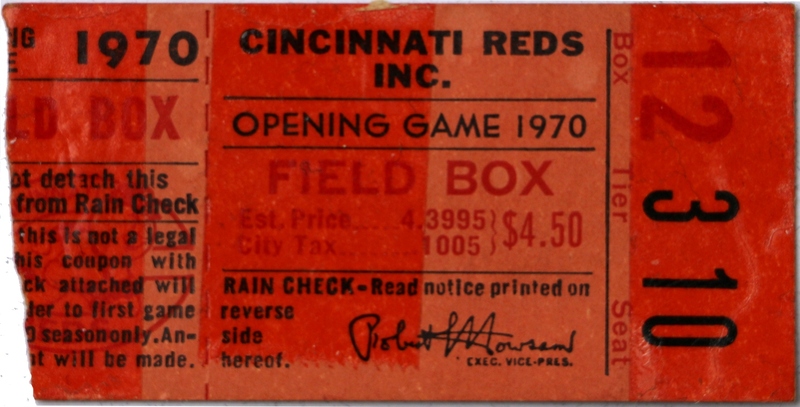 After a two week delay, due to a player's strike, Joe Morgan plays his first game as a Red (first at bat, grounds out, but advances Rose to third). Pete Rose gets a double & a single (career hits #1,725 & #1,726), Don Sutton gets the Win (career #84) with 5 KOs (career #1,153 to #1,157). Sutton, one of only 10 pitchers to be in the 300W/3,000KO club, would go on to Win 324 games and have 3,574 Strikeouts. The game time temperature was listed as 42 degrees. For the Reds: Pete Rose gets two singles (career hits #1,923 & #1,924). Tony Perez gets a double & Joe Morgan a single. For the Giants: Willie McCovey has a single and Chris Speier's single drives in 2 runs. Juan Marichal get the Complete Game win with 2 strikeouts (his 228th career win). Gene Locklear makes his major league debut with the Reds. Hank Aaron hits his 714th Home-run. The Home-run comes off Jack Billingham with 2 on in the 1st, to tie Babe Ruth for the Home-run record. Tony Perez hits his 211th Home-run, with 2 on, and Pete Rose gets 3 hits (career #2,153 - #2,155) including 2 doubles. Phil Niekro picked up 2 KOs (#1173 & #1,174 of his 3,342 career total), but Clay Carroll would get the win. For the Big Red Machine: Pete Rose gets three hits (career #2,548 - #2,550) including a triple, Joe Morgan would also get three hits and Tony Perez two; For the Astros: Cesar Cedeno and Bob Watson hit back-to-back Home-runs. Gary Nolan gets the Win. Joaquin Andujar debut. 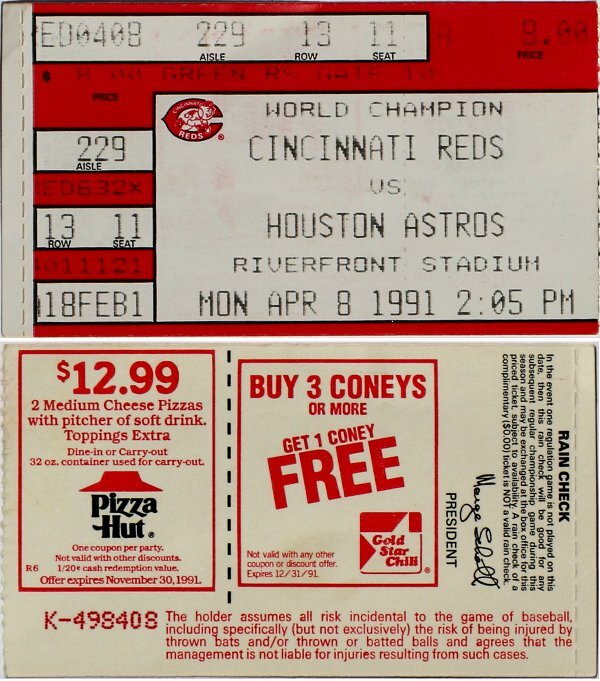 For the Reds: Joe Morgan would a double, George Foster a triple and Cesar Geronimo gets his 25th career Home-run; For the Astros: Cesar Cedeno and Bob Watson hit back-to-back Home-runs. Woodie Fryman gets the Win. Gene Richards and Victor Bernal debut for the Padres. For the Reds: Pete Rose gets a double for his #2,967 career hit (he would reach 3,000 on May 5 of the 1978 season); For the Astros: Terry Puhl (1st career Home-run), Cesar Cedeno and Joe Ferguson all hit Home-runs. Tom Seaver gets the start for the Reds, but Pedro Borbon gets the Win. For the Reds: Johnny Bench and Joe Morgan would both single and get a run; For the Astros: Mike Ivie hits his second Opening Day Home-run against the Reds (the other in 1977). Vida Blue gets the Win with a complete game. Tom Seaver gets the Loss. Frank Pastore debut for the Reds, pitching 3 innings and allowing 1 hit and no earned runs. 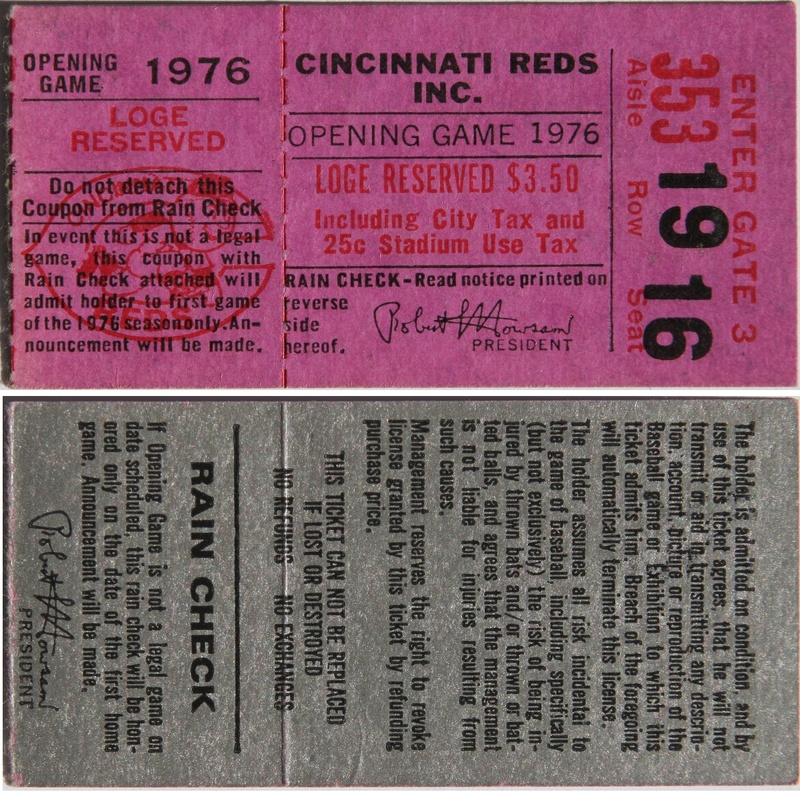 For the Reds: Johnny Bench gets a double and George Foster hits his 202nd career Home-run; Frank Pastore pitches a 3-hit Shut Out for the Win in a complete game. Phil Niekro gets the Loss, but adds two KOs (#2,403 & #2,404 of his 3,342 career total). For the Reds: Johnny Bench hits a single and a double, scoring once and getting an RBI. Both Gary Redus and Ron Oester hit Home-runs off of Phil Niekro. In the bottom of the 8th, Dave Concepcion singles to RF driving in what would be the winning run; For Atlanta: Chris Chambliss gets his 152nd career Home-run. Phil Niekro adds two KOs to his 3,342 career total (#2,785 & #2,786). Mario Soto gets the Win with 5 KOs. Jeff Jones debut for the Reds. For the Reds: Both Eddie Milner and Dave Concepcion hit Home-runs. In Dave Parker's first game with the Reds, he would get 2 hits, a run and 2 RBIs; For the Mets: Darryl Strawberry gets his 27th career Home-run providing the Mets with their only run. Mario Soto gets the complete game Win with 8 KOs. Ross Jones debut for the Mets. For the Reds: Pete Rose has a double and a single (hits #4098 and #4099) and drives in 3 runs. Eric Davis gets a double and has 2 steals. Dave Parker has 2 singles and drives in a run. Mario Soto picks up the win for the Reds with 5 strikeouts. Tim Burke, who would become an All-Star in 1989, makes his debut for Montreal. For the Reds: Both Eric Davis (career #19) and Dave Parker (#217) hit Home-runs off of Steve Carlton. Dave Parker also hit two doubles to go 3-for-4 on the day; For the Phillies: Mike Schmidt gets his 459th career Home-run. Mario Soto gets the Win and Steve Carlton the Loss. Pete Rose gets his second Opening Day Win as a Manager. Tracy Jones debut for the Reds. For the Reds: Barry Larkin hits his 4th career home run in his first Opening Day Game. Eric Davis hits his 46th career home run. Dave Parker gets a double and a run. Terry Francona also has a home run. For Montreal: Mitch Webster hits his 20th home run of his career. Bill Landrum picks up the win for the Reds. Leo Garcia and Lloyd McClendon make their debut for Cincinnati. Alonzo Powell makes his debut for Montreal. For the Reds: Barry Larkin has two singles, Rookie, Chris Sabo, has a single and a stolen base and Kal Daniels hits a Home-run; For the Cardinals: Ozzie Smith has two singles and a stolen base and pitcher Joe Magrane hits a Home-run with 2 runners on base. Mario Soto gets the start, but Pat Perry gets the win. Chris Sabo debut for the Reds. For the Reds: Barry Larkin has a single (his 327th career hit) and Paul O'Neill has 4 hits, which includes a double and a three run Home-run for his 24th career Home-run. These four hits for O'Neill bring in 3 runs. For the Dodgers: Kirk Gibson hits a single and his 176th career Home-run, but Eddie Murray goes 0 for 4. Danny Jackson gets the win. 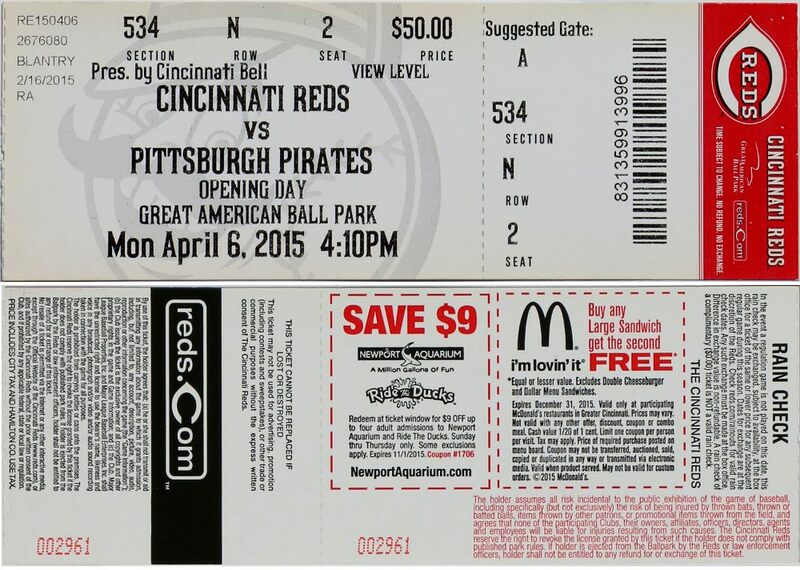 The Reds original 1990 Opening Day Game was set for April 2, but because of another strike, Opening Day was delayed. The Reds started season started on the road at Houston. The Opener was actually played on the 17th. After a month long strike. For the Reds: Barry Larkin had 3 singles (his career hits number 454, 455 and 456) and a stolen base. Billy Hatcher also had 3 hits and brought home one run during the game. Mariano Duncan brought in the other run for the Reds. For the Padres: Roberto Alomar had 3 hits and Benito Santiago scored the Padres only run with a solo Home-run, his 49th career Home-run. Tom Browning walked away with the Win. For the Reds: Barry Larkin hits his 39th career home run. Eric Davis hits 2 singles. Paul O'Neill gets a double and a run. For Houston: Craig Biggio hits his 21st home run of his career. Tom Browning picks up the win for the Reds with 4 strikeouts. Hall of Fame member, Jeff Bagwell and 3x All-Star, Darryl Kile make their debut for Houston. For the Reds: The one highlight for the Reds is a Home-run for Reggie Sanders his 34th of his career; For the Cardinals: Ozzie Smith has a single for his 2,266 career hit and Ray Lankford hits his 40th career Home-run (a Lead-off Home-run). Bob Tewksbury gets the Win with 1 KO. For the Reds: Barry Larkin has a double and a stolen base. Chris Sabo gets a single a double and a stolen base; For the Expos: Mark Grudzielanek and Mike Lansing both get a double. Pete Schourek gets the Win with 5 KOs. For the Reds: Deion Sanders plays his first Opening Day game for the Reds and ends up with a Single, Double and 2 stolen bases. Barry Larkin walks 4 times and scores 3 runs. Hal Morris has 3 hits and 3 RBIs; For the Rockies: Ellis Burks (178th of career) and Vinny Castilla (85th of career) both hit Home-runs. John Smiley gets the win. Pokey Reese debut for the Reds. For the Reds: Bret Boone gets a single and a RBI; For the Rockies: Wally Joyner would hit his 180th career Home-run and Tony Gwynn would hit his 108th Home-run, which was his #2,781 career hit. Kevin Brown gets the Win with 7 KOs. This was the largest crowd in Opening Day history for the Cincinnati Reds, as Ken Griffey Jr.'s plays his first game as a Cincinnati Red. He would go 0 for 2 in the 6.5 inning game. The game was called due to a nearly 3 hour rain delay. Barry Larkin hit a single and a double (his 1,885th and 1,886th hits of his career) with a run and a RBI. Michael Tucker hit his 55th career Home-run. Dmitri Young drives in the 3rd run for the Reds. For the Brewers, Marquis Grissom and Mark Loretta both drive in runs. Ronnie Belliard got the only extra-base hit for the Brewers, also scoring a run. 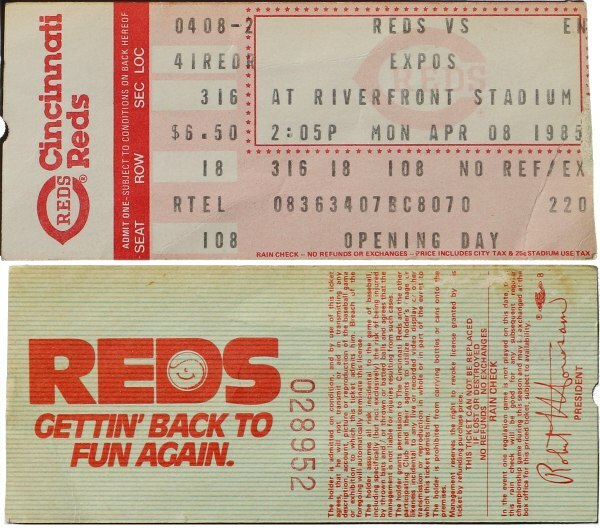 Last Opening Day at Riverfront Stadium/Cinergy Field. For the Reds: Ken Griffey Jr. gets a Single and Barry Larkin hits two. Todd Walker gets two doubles and a Home-run (#48 of career). For the Chicago Cubs: Fred McGriff and Sammy Sosa both hit singles; Danny Graves picked up the Win. Full intact tickets, such as the one shown, measure 10.5 by 5.5 inches. 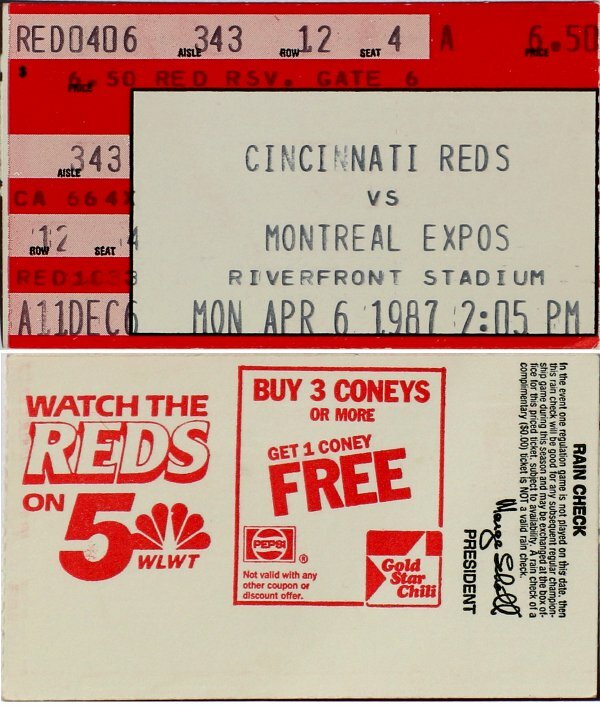 The left side gives some highlights of Riverfront Stadium/Cinergy Field, such as the Big Red Machine, Pete Rose's 4192 hit, Tom Browning's perfect game and the 1990 Wire-to-Wire Season. 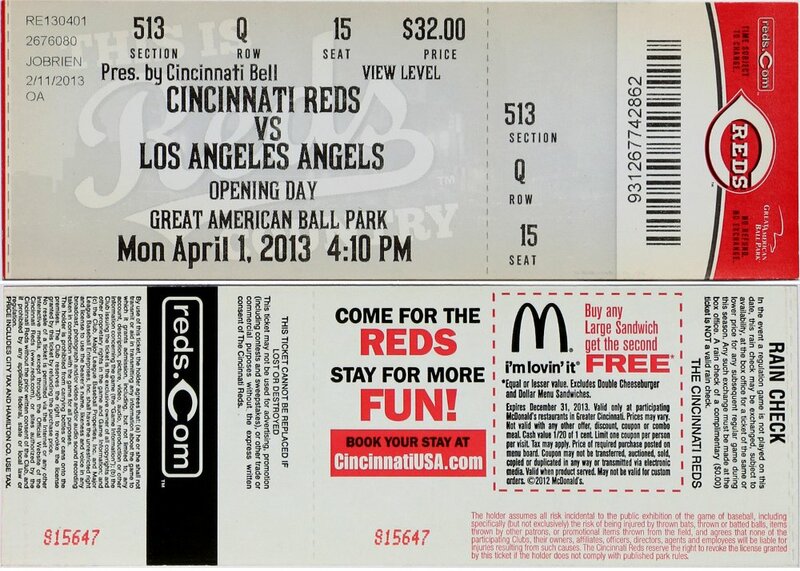 This was the first regular season game played at Great American Ball Park. The first game played here was March 28, 2003 (an exhibition against the Cleveland Indians and where groundbreaking started on October 4, 2000). For the Reds: Ken Griffey Jr. gets a double (his 2,040th career hit) and pitcher Jimmy Haynes also gets a double. Haynes scores the Reds lone run. Sean Casey and Reggie Taylor are the only others to get hits in the game, although Austin Kearns gets a walk and pushes in the only run for the reds. The Reds use 6 pitchers in the game, Jimmy Haynes (who gets 6 earned runs and the loss), Felix Heredia, Scott Sullivan, John Riedling, Gabe White and Scott Williamson. For the Pirates: Three players had Home-runs, all off Jimmy Haynes, they were Reggie Sanders (career Home-run #219, along with two singles and two RBIs), Jason Kendall (#59) and Kenny Lofton (#104). Lofton also has a single, a walk, along with 2 runs and 3 RBIs. The Pirates pitcher Kris Benson picks up the easy Win with 3 strikeouts in 6.1 innings. Barry Larkin gets a walk, a run and an RBI. Sean Casey gets a Sinle and a Double along with 2 RBIs. For the Cubs: Corey Patterson hit his 34th career Home-run; Michael Wuertz debut for the Cubs. Kerry Wood gets the Win with 6 KOs. For the Reds, Home runs by: Adam Dunn(2 for #119 & #120 of career) & Joe Randa. For the Mets, Home runs by: Kazuo Matsui, Carlos Beltran (#147 of career) & Cliff Floyd. Pedro Martinez has 12 strikeouts (#2654 - #2665 of career); 35 year old, Dae-Sung Koo, debuts for the Mets. Braden Looper gets the loss and the win goes to Danny Graves. For the Reds: Brandon Phillips has a triple, hits in a run and scores a run. Adam Dunn grounds out, but picks up a RBI. Ken Griffey Jr. has a walk and scores a run. For the Diamondbacks: Chris Young Home-run #35, Eric Byrnes Home-run #96, Jeff Salazar Home-run #3. Brandon Webb gets the Win with 6 strikeouts and Brandon Lyon gets the Save. Aaron Harang gets the loss also with 6 strikeouts. Joey Votto gets a single (his 184th career hit) and Jay Bruce gets a double. Brandon Phillips brings in the only run, which is scored by Darnell McDonald. The Reds use 6 pitchers in the game: Aaron Harang, Danny Herrera, Mike Lincoln, Arthur Rhodes, David Weathers and Francisco Cordero. For the Mets: Daniel Murphy hit his 3rd career Home-run. He would in the 6th, ground out, but would bring the runner on third in for his 2nd RBI of the game, which is all that they need for the Win. Carlos Beltran also gets a single. Johan Santana gets the Win with 7 KOs. Francisco Rodriguez gets the save. Six Home-runs in the game. For the Reds: Home-runs by both Joey Votto (#54 of career) and Scott Rolengets (#284). Votto would also have two singles for a total of 3 hits on the day (hits #335 to #337 of his career). Four Home-runs for the Cardinals: Albert Pujols hits two (career #367 & #368) and one each by Colby Rasmus (#17) and Yadier Molina (#36, which was a Grand-Slam). Pujols also hits two singles for a total of four hits on the day (hits #1718 to #1721 of his career). Chris Carpenter gets the Win with 3 KOs. Logan Ondrusek debut for the Reds. One on the most exciting finishes to a game. Ramon Hernandez hits a walk-off 3-run Home-run with two outs (career Home-run #150). Hernandez also has 3 singles for 4 hits total on the day. The Reds also had two other Home-runs with one each by Joey Votto (#91, which is his 512th career hit) and Drew Stubbs (#31). The Brewers also had three Home-runs: one each by Rickie Weeks (career #90, which was a Lead-Off Home-run), Carlos Gomez (#18) & Ryan Braun (#129). Edinson Volquez gets the start and has 5 strikeouts, but Logan Ondrusek gets the Win. Largest crowd to date at Great American Ball Park. Jay Bruce hits his 101st career Home-run to deep center field. Johnny Gaby Sanchez would be the only Miami player with an extra base hit, a double in the 7th. Cueto gets the Shutout Win with 4 KOs. For the Reds: Shin-Soo Choo has a double and a single. Todd Frazier has the only other hit for the Reds, a single. For the Angels: Chris Iannetta Home-run #3. Mark Lowe gets the Win with 3 strikeouts and Ernesto Frieri gets the Save. Johnny Cueto gets the start and has 9 strikeouts, Aroldis Chapman has 2 strikeouts, but J.J. Hoover ends up with the loss. For the Reds: Todd Frazier is the only highlight for the Reds, having 2 hits and a stolen-base. Brandon Phillips has the only other hit for the Reds, a single. For the Cardinals: Yadier Molina scores the only run of the game with a Home-run #90 of his career. Matt Adams has the only other extra-base hit, a double, and also has a single. Adam Wainwright gets the Win his 100th career win, with 9 strikeouts and Trevor Rosenthal gets the Save. Johnny Cueto gets the start and has 8 strikeouts and the loss. For the Reds: Jay Bruce HR #183. Todd Frazier has his 74th Home run, a 3 run Home run, which wins the game for the Reds. Joey Votto has 2 hits (#1056 & #1057 of career). Johnny Cueto gets the start and has 10 strikeouts (including his 1,000th strikeout, strikeouts #996 to #1005), but Jumbo Diaz gets the win with a strikeout and Aroldis Chapman gets the save with 2 strikeouts. For the Pirates: Andrew McCutchen Home-run #129. Josh Harrison gets two hits, a single and a double. Francisco Liriano gets the start for the Pirates and has 7 strikeouts, but Tony Watson picks up the loss. For the Reds: Zack Cozart has 3 hits, including 2 double, a run and drives in another run. Joey Votto has a hit (hit #1227 of his career) and drives in 2 runs. Jay Bruce also has a hit and also drives in 2 runs. Scott Schebler has a double and a run. Raisel Iglesias gets the start and has 7 strikeouts, but Ross Ohlendorf gets the win with a strikeout. For the Phillies: Freddy Galvis Home-run #21. Cesar Hernandez gets two hits, a single and a double. Jeremy Hellickson gets the start for the Phillies, but David Hernandez picks up the loss.